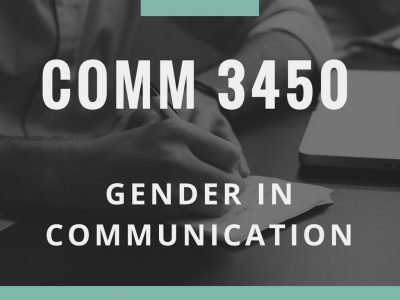 Both Women’s, Gender, Sexuality Studies and Communication students are enrolled in Gender in Communication (COMM 3450) , currently being taught by graduate student Kara Winkler. The course explores the overlap between WGSS concepts and the ways in which humans communicate. Similar to persuasion (COMM 3100), the course allows students to be a part of a semester long group project that creates a campaign to address social issues happening on the UConn campus. This course was created to help students understand how social and biological constructs intersect and interact to produce gender and to understand how gender influences and is influenced by language, relationships, and communication. By the end of the course, students recognize that gender cannot be fully understood without examining its relationship to class, race, ethnicity, religion, and sexual orientation, while articulating the influence of media in the construction and perpetuation of the meaning of gender. The Gender in Communication project allows students to create campaigns based on issues surrounding gender. Each campaign brings attention towards an important issue on the UConn campus. Students this semester are focusing on gender stereotypes, intersectional feminism, women’s reproductive rights, women in the workplace, and many more interesting topics. Each campaign is presented to the class and brought to the campus where they are promoted through social media, websites, panels etc. The promotional materials are now filling the campus and internet, gaining many followers for each campaign. Overall, the campaign project is a fun, interactive, and rewarding way to demonstrate understanding of course concepts and also get involved in the UConn community. Gender plays an incredibly important role in the way we communicate. The course touches upon the influence of culture, language, stereotypes, values, and many more things on our perceptions of gender, and how our perceptions of gender influence all of those things as well. The effects of gender in communication depends on the person and their own experiences and challenges with gender identities, expressions, and expectations. Learning about gender and communication is important for understanding our complex social world. “I think the most important aspect of this course is exposure ideas that challenge previously held beliefs, attitudes, and values that are so deeply ingrained in our society” says Winkler. Every year the Department of Communication award the Martin Horn Scholarship to an outstanding undergraduate student. Since achieving great success in marketing communications, alumnus Martin Horn has made several generous donations to the department, from which the scholarship is awarded. The 2016-2017 recipient of the scholarship is Katie Landrey. Katie is a senior, double majoring in Psychological Sciences and Communication. She added a Communication major in her junior year at the university. Interpersonal communication and public speaking have always been areas of interest for her studies because of her experiences facilitating small group discussions and giving presentations. Katie has previous experience teaching for Freedom School, which is a national program that strives to improve literacy skills in low income minority students. Her role with the school was to create lesson plans and to work one-on-one with scholars and staff. In addition to the Freedom School, Katie has experience facilitating discussions. 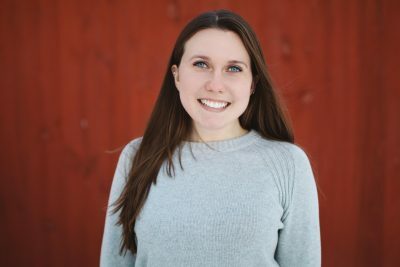 She was a teaching assistant for UConn’s First Year Experience program as well as a trained facilitator for The Body Project, which is a cognitive dissonance based program that promotes positive body image. In the future, Katie aspires to earn her Masters in higher education where she can have a career that allows her to work with students on a daily basis, helping them with both career and academic development. She wants a career where her ability to effectively communicate in various settings is important, so studying communication was an easy choice for her to make and added to her knowledge and skills. This scholarship created more opportunity for Katie. She stated, “My peers in the Communication department are outstanding, and it is an honor to be recognized amongst such an intelligent group of students. This recognition does help in my pursuit of a graduate education, and it has impacted my confidence as I continue to develop professionally and academically.” The Department of Communication is proud of Katie and is excited to see where this scholarship will take her.